So many new icons, but I can’t seem to find the one that allows me to download the game to my database. 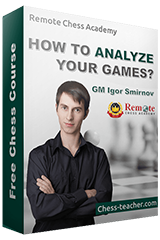 Thank you for your feedback about the Chess game viewer. We have noted it down. Indeed there are lot of options it can be confusing. If you are unaware of what each icon does you can hover over the icon with your mouse and there will be the name of the icon. So many new icons, but I can’t seem to find the one that allows me to download the game to my database. Problem solved. The download icon has been changed to a “save” icon. I’ll leave this message here for the benefit of others who, like myself, may not be that savvy with deciphering a plethora of icons. I was so focused on trying to find the download icon that it was a while before I even noticed the standard save icon. Another great lesson! It’s interesting to note the patience displayed by Carlsen despite being in attack mode for many moves, taking time out for critical defensive moves, as well as moves that don’t create any specific threats but incrementally move the attack forward. However, I don’t really understand 21.c4, as it seems White can play Nf3-d4 in any case, when he so wishes (ensuring, of course, that he doesn’t leave his rook en prise). With 21.c4 White would like to close the c file. Black queen cannot capture on c2 and she cannot penetrate on c3. This is the point of c4. Only two moves later, White allows Black’s queen to capture on c2 and to penetrate on c3, so preventing that incursion does not really seem to be the point. There’s probably a subtle feature we’re both overlooking.